Opened 1901. 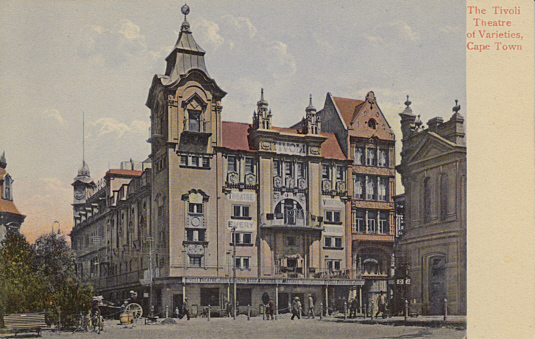 Demolished in the 1930s. Front Text: "The Tivoli Theatre of Varieties, Cape Town"
Publisher: John G. Bain, Cape Town; 138823; "Iristyped in Saxony"
Front Text: "The Tivoli Theatre, Cape Town", inscriptions: "Tivoli", "Celebrity Vaudeville Every Evening", on marquee: "Martin & Castle - Napier & Yvonne - Jack Boot - Performances at 8.15. 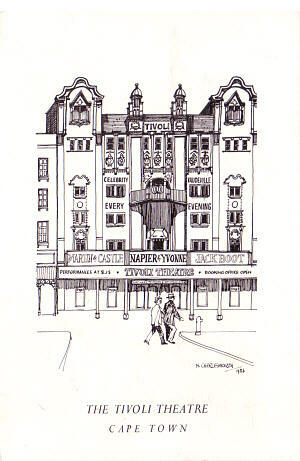 - Tivoli Theatre - Booking Office Open"